Hello blogging friends! 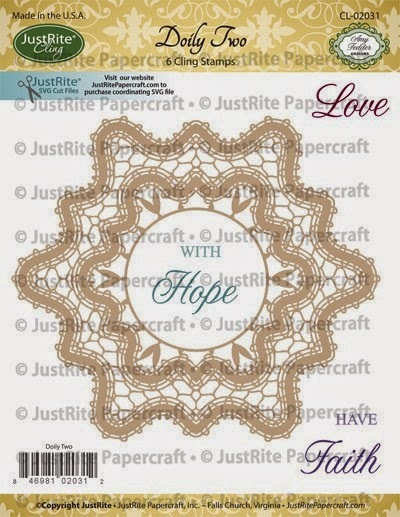 Today, is the first day of the May New Release from JustRite® Papercraft and we have some really pretty and fun stamp sets to share with you and also some New SVG Files to coordinate with the stamp sets. For my project I used one of the new stamp sets and the matching SVG cut file. Here is the card that I designed. I used light blue cardstock for the base. For the mat I used simply smooth ivory and then randomly stamped the doily image from the CL-02031 Doily Two Cling Stamps using Tumbled Glass Distress Ink. Then I lightly inked the edges with Vintage Photo Distress Ink and edged the card with Memento Espresso Truffle. I used the offset SVG Doily Two Digital Cut File Download with my Silhouette Cameo to cut the doily shape. Then I stamped and inked the cut shape with the same stamp and inks as the background. Here is a close up of the cut shape. I also added a tulle flower with a doily and then a button on top. I added Ranger Rock Candy Distress Glitter to the outer edges. I added some lace, seam binding and a handmade stick pin with a few sequins. To finish off the card I stamped a sentiment in the lower right corner. (experiencing Typepad service issues this morning- Thank You for your patience). Tutorial Tuesday - How to Download SVG Cut Files to your Cameo from JustRite Papercraft- Giveaway! Hello everyone! 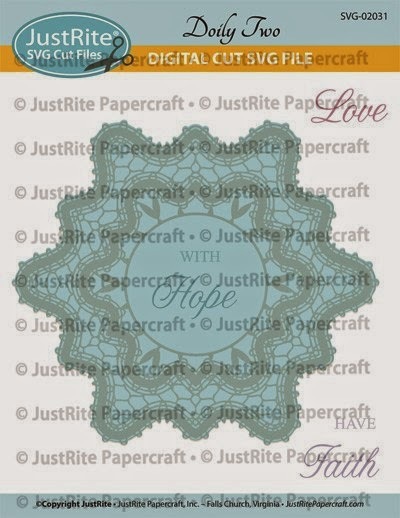 It's time for another Tutorial Tuesday with JustRite® Papercraft. For the video tutorial I show you step-by-step with screen shot images How to Download SVG Cut Files to your Cameo from JustRite Papercraft. I created a baby card using the SVG-04815 SVG Special Delivery Digital Cut File Download for CR-04815 and coordinating CR-04815 Special Delivery Clear Stamps from JustRite® Papercraft. Here is the card I designed. 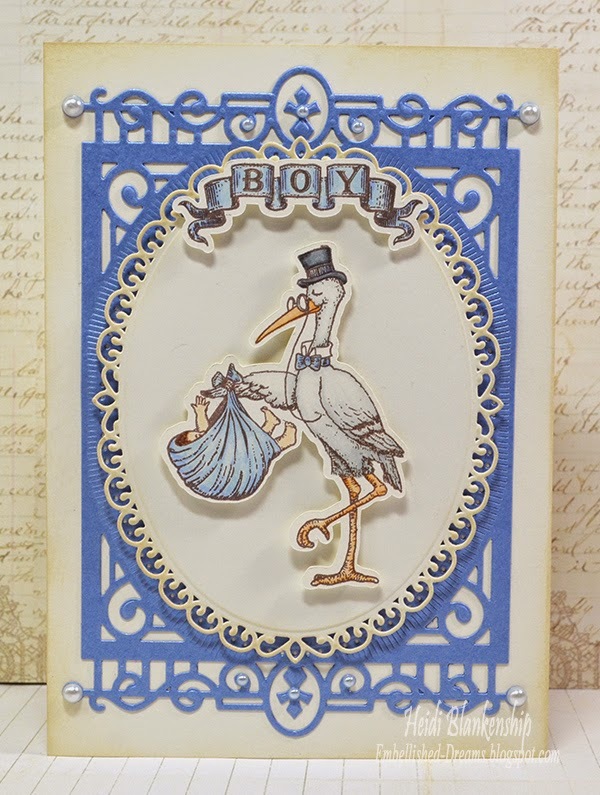 The stork with the baby and the baby banner are both cuts from the SVG-04815 SVG Special Delivery Digital Cut File Download for CR-04815 file. 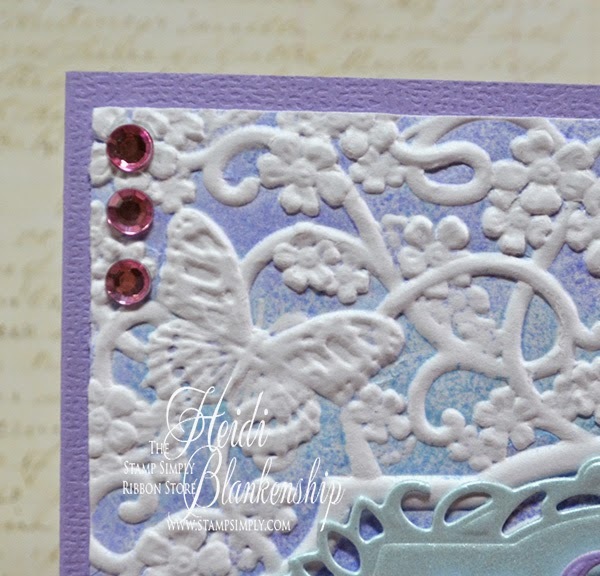 I also used 6-010 5 x 7 Heirloom Legacy and S4-425 Elegant Ovals die templates from Spellbinders Paper Arts®. I used Spectrum Nior™ markers to color the image. GIVEAWAY on the JUSTRITE INSPIRATION BLOG!! This week's Tutorial Tuesday Giveaway is a $75.00 Shopping Spree on the JustRite Website. Simply leave a comment on the JustRite Inspiration Blog or on Heidi's Video telling us if you have an electronic cutting machine, what machine you are currently using and what you like to create with your machine. If you don't have an electronic cutting machine is buying one on your wish list and what would be the first think that you make with it? Good Luck! Hop on over to the JustRite Inspiration Blog to find out all of the details, see more photos and check out the video tutorial. If you have any questions or comments please feel free to leave them here, on the JustRite Inspiration Blog or on the YouTube Video. Hello and Happy Monday! 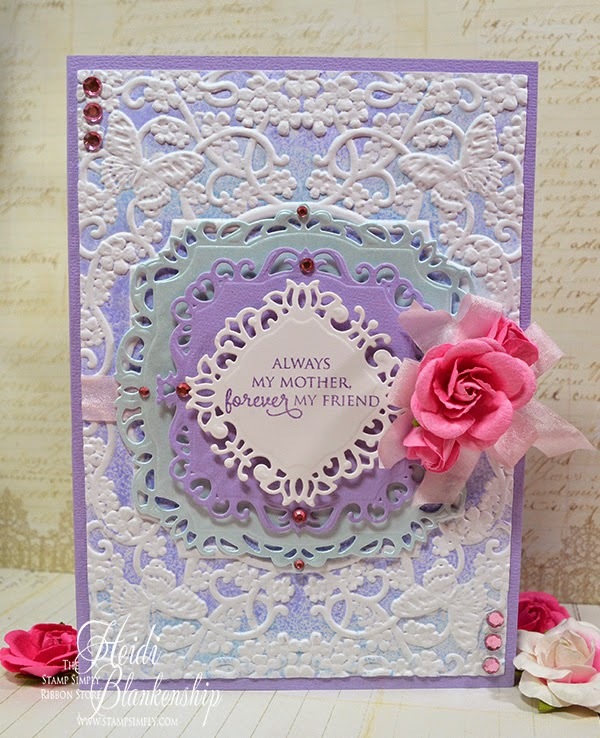 Mother's Day is just around the corner and today I have a pretty card to share using products from The Stamp Simply Ribbon Store that could be used for this special occasion. I love the soft lavender and blue with just a touch of pink on the card. I used lavender cardstock for the base of the card. Then I created an embossed mat using simply smooth white cardstock, Ranger Distress Inks-Shaded Lilac, Tumbled Glass and E3D-016 Labels 34 Medallion M-bossabilities folder. Apply the ink directly to the flat side of the embossing folder starting with the lightest color of ink. Mist the front and back of the white cardstock with water--doing this breaks down the fibers in the paper and give you a nice crisp emboss. Then I used three of the die templates from the S4-427 Decorative Labels Thirty-Four set to cut and emboss the label shapes using sky metallic, lavender, and simply smooth white cardstock. I used a stamp from the JustRite® Papercraft AG-04940 Happy Occasion Belly Bands Two stamp set for the sentiment and I used Dusty Concord distress ink. I added some Pink Wrinkled Ribbon and layered all of the die cuts using 3D Foam Squares. Then I added a bow, Prima Interlude-Pink Roses, and Kaisercraft Light Pink Rhinestones. I also added some Kaisercraft Light Pink Rhinestones to a couple of the corners. The sentiment on the card doesn't have to be just for Mother's Day--it could also be used for a birthday or even just a thinking of you card. Hello everyone! 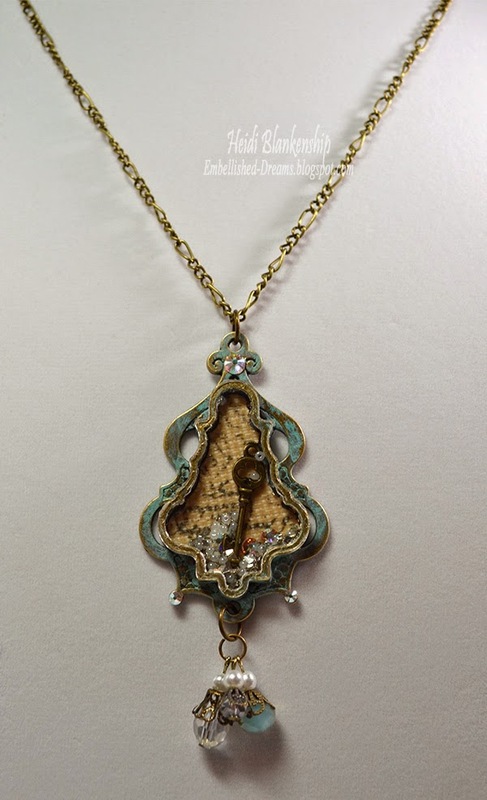 Today, I have a couple of necklaces to share with you using products from ButterBeeScraps. Here is the first necklace that I designed. 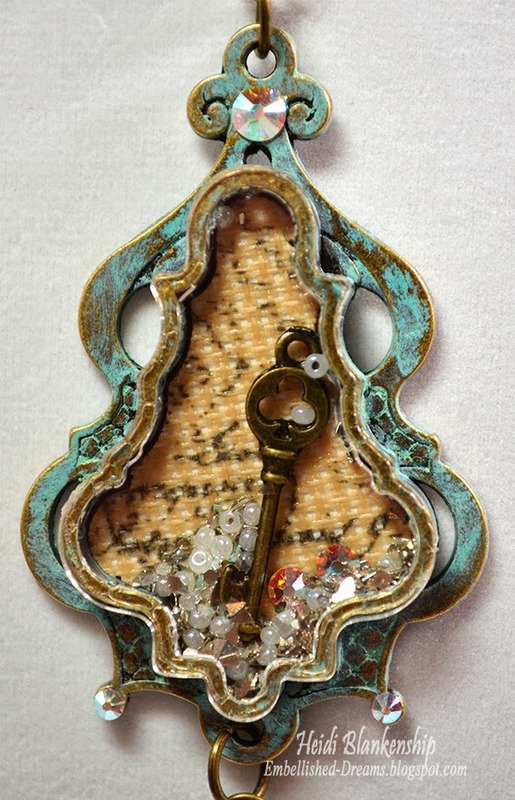 I used one of the Silver Key and a Resin Flower Embellishments (Item #RES606-BK). 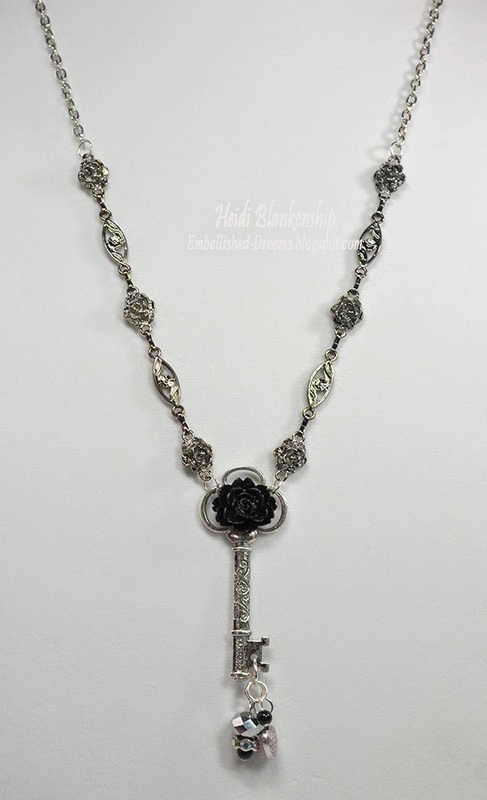 This style of silver key is currently out of stock but there are several keys at ButterBeeScraps that would also work to create this necklace. 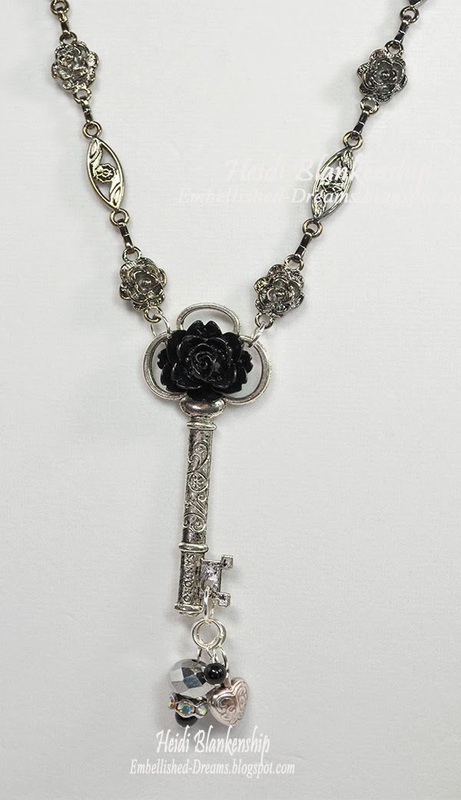 I used E6000 to adhere the rose to the front of the key. Then I used a screw hole action punch to punch a hole in the bottom of the key so I could dangle some beads and a charm. Here is a close up of the key. I made a couple of small bead dangles and added a Heart Charm using Silver Jump Rings. 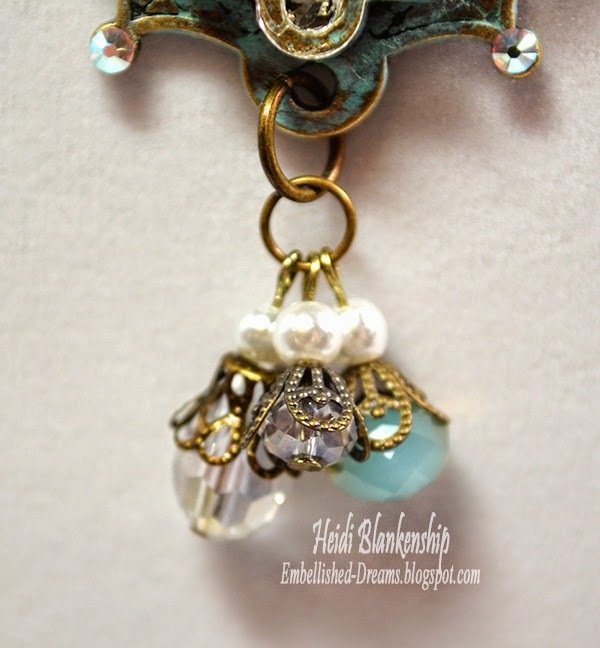 Here is a close up of the bead dangles and the charm. For the chain I used some Rose Link Chain and then I also added some Silver Chain and a clasp to finish off the necklace. 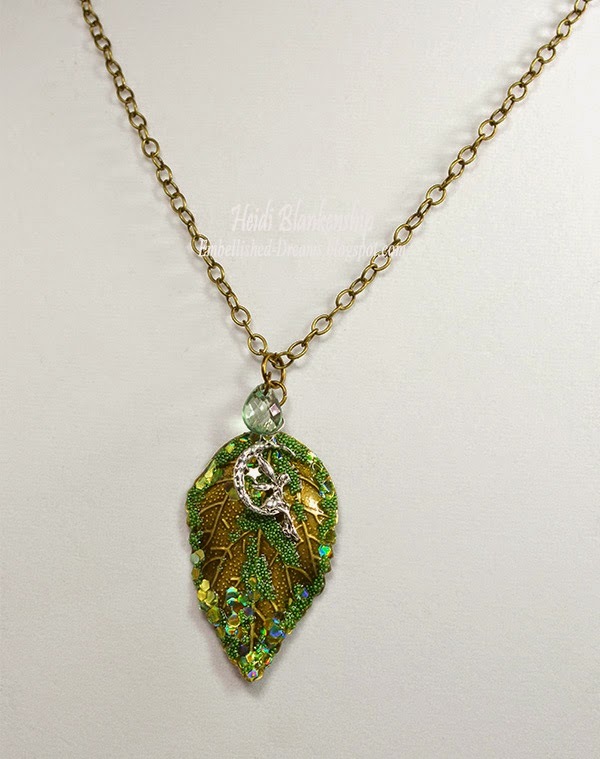 Here is the second necklace that I designed and I have to say I love how this one turned out! I love the colors, texture and all the sparkle! I used a Bronze Leaf and then I applied glossy accents, micro beads, and glitter bits. Once it was dry I applied glossy accents over the entire piece. Bronze Curb Chain (Item #CH481-B) and added a clasp. I hope you enjoyed both of the necklaces that I shared today. 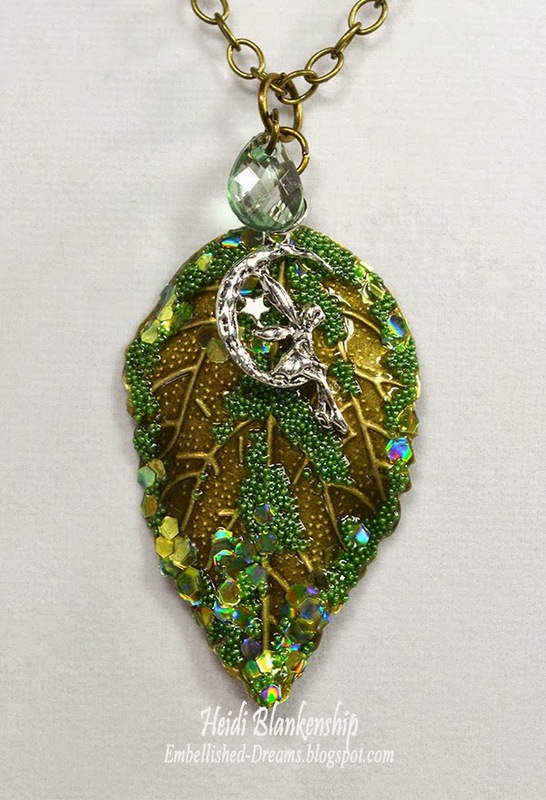 If you like to create jewelry or work with metals in your paper crafts or mixed media projects hop on over to ButterBeeScraps and check out all of the really fun metal pieces. Thanks so much for stopping by today and I hope you have a great weekend! Hello blogging friends! 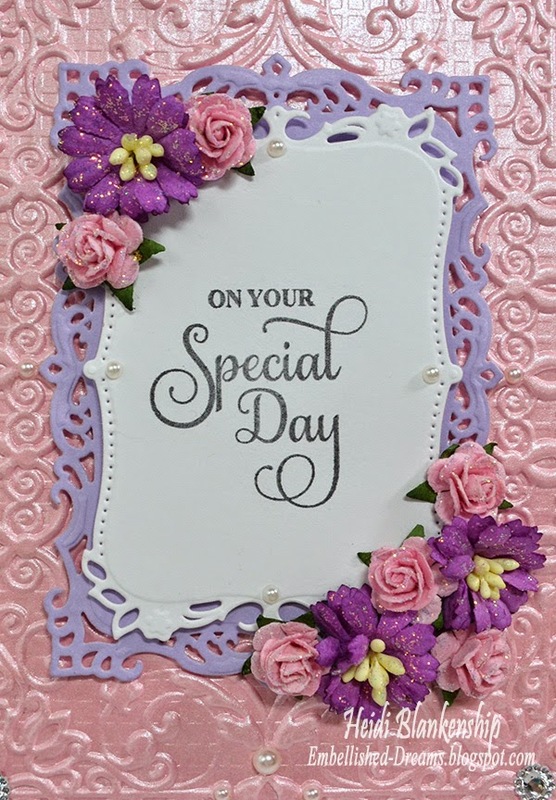 Today I have an all occasion style card to share with you using some Spellbinders Paper Arts® die templates and M-bossabilites folder and a stamp set from JustRite® Papercraft. I used pastel papers which are prefect for Spring and the sentiment could be changed out for several different occasions such as birthday, TOY, Wedding or Anniversary just to name a few. For the sentiment I used a stamp from the CR-04405 Enjoy the Day Vintage Labels Four Clear Stamps from JustRite® Papercraft. Then I used S5-208 Majestic Labels Eight and S5-148 Decorative Labels Eight to create the die cuts. For the background I used pink metallic paper and embossed it with E3D-018 European Tapestry. I adhered all of the layers together using E-Z Runner® Permanent Strips-Refillable Dispenser 49' and 3D Foam Squares from Scrapbook Adhesives by 3L™. 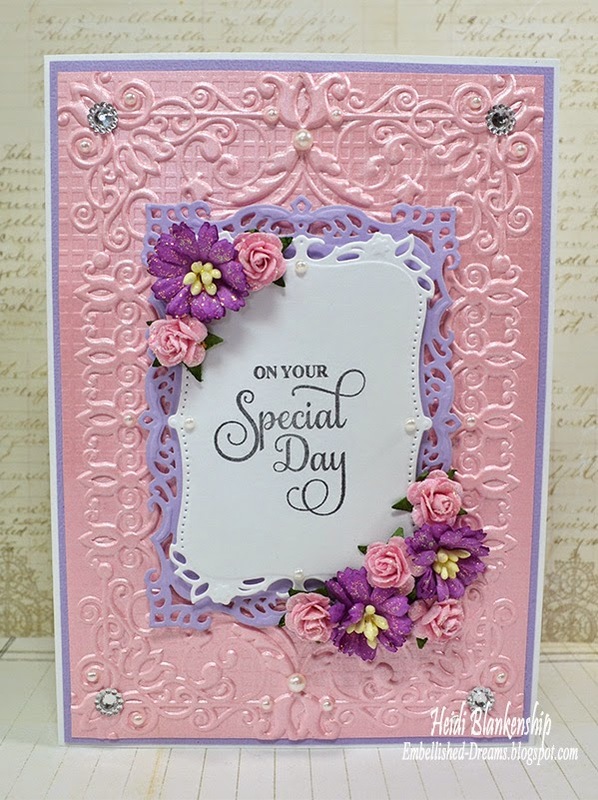 To finish off the card I added some flower rhinestones, pearls and Wild Orchid Craft flowers with a little bit of diamond stickles. Hello everyone! The weather is finally starting to warm up here in MN. I can't wait until it's warm enough to plant some flowers and a garden. But in the meantime I have been keeping busy making some fun Spring and Summer time jewelry which I will be sharing with you over the next couple of weeks. 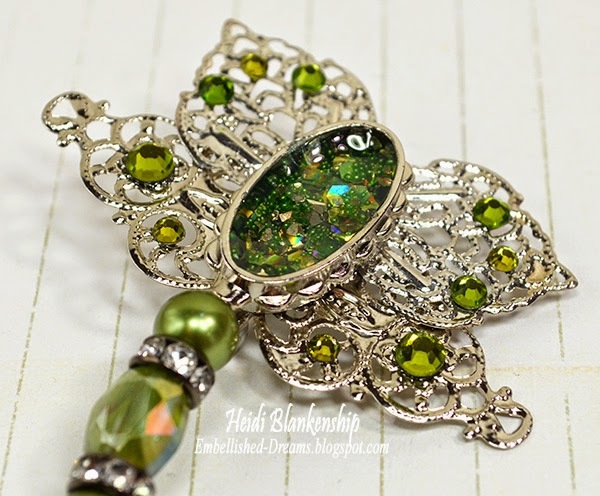 Today, I have a couple dragonfly pins to share with you using some fun products from ButterBeeScraps and Spellbinders Paper Arts®. 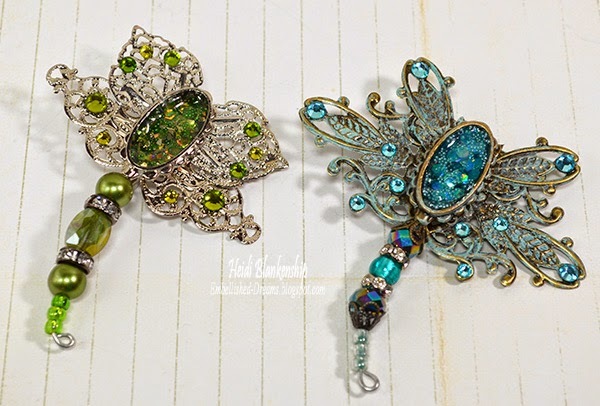 These are the two dragonfly pins I designed. 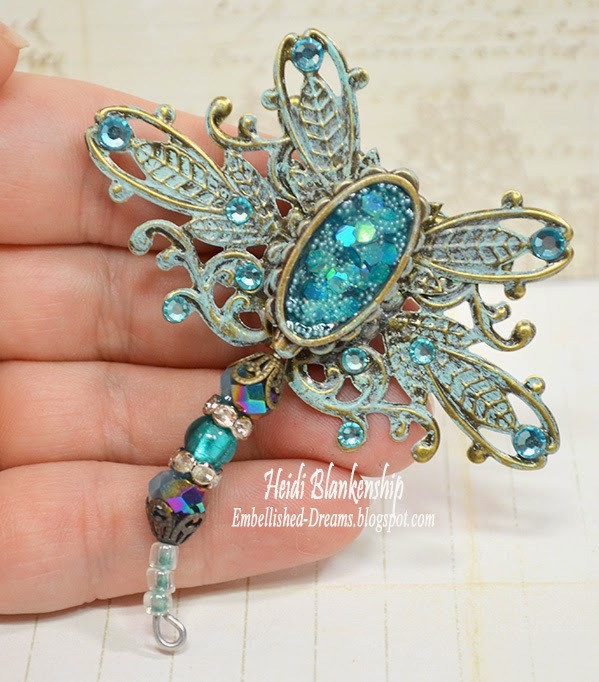 I used filigree pieces, crystals, rhinestone rondelle spacer beads, and bead caps from ButterBeeScraps and for the body of the dragonflies I used hatpins from Spellbinders Paper Arts®. To start I added German Glass Glitter, Micro Beads and Glitter inside the bezel on the MB#-002 Oval Hatpin-Silver and then I filled it with Glossy Accents and set it aside to dry. 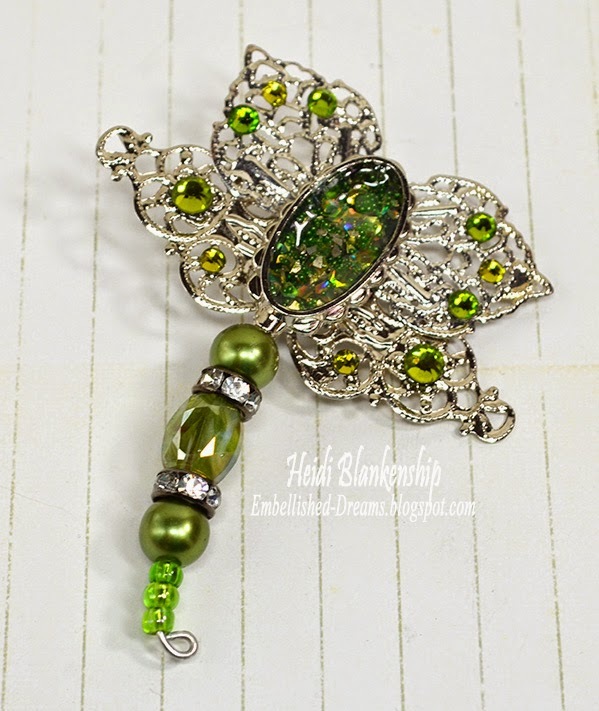 I used two different styles of the filigree pieces Silver Filigree Embellishment (Item #809-P) and Silver Filigree (currently out of stock) for the wings. I cut the pieces in half and then I used E6000 to attach them to the back of the MB#-002 Oval Hatpin-Silver. 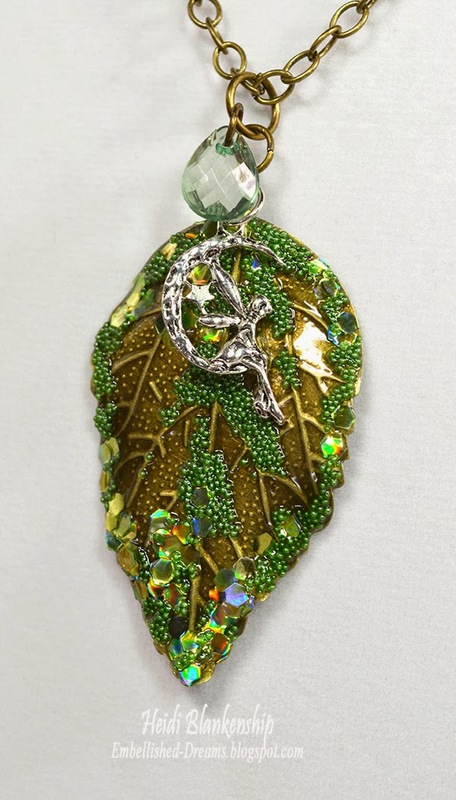 Next I added SS12 Olivine Flat Back Glass Rhinestones , SS16 Olivine Flat Back Glass Rhinestones, and SS20 Olivine Flat Back Glass Rhinestones to the wings. Then I added some Clear Rhinestone Rondelle Spacer Beads - 6mm (Item #BD006-P/CL) and some beads from my stash. 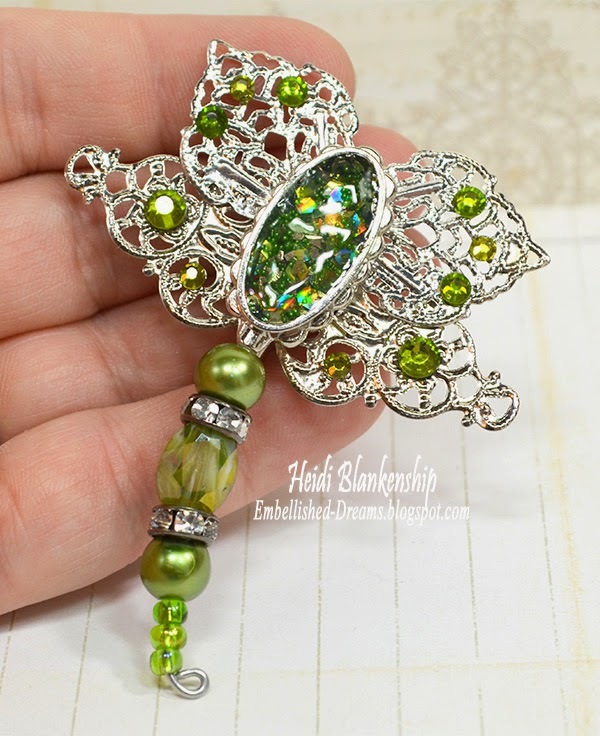 To finish the dragonfly I used a round nose pliers to create a loop at the end of the hatpin and then I added a pin back using E6000. Here is a close up of the bezel. I love all of the sparkle from the different glitters and micro beads! 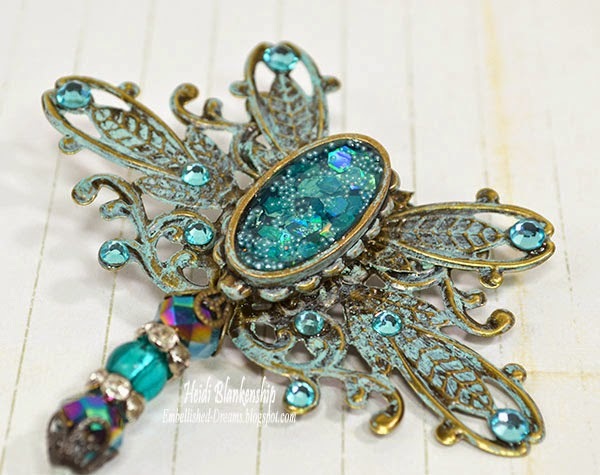 Here is the aqua blue dragonfly. I have to tell you this one is my favorite! I love the colors and the patina!! I filled the bezels with glitters, micro beads and glossy accents just like the first one but using different colors. For the wings I used Bronze Filigree Embellishment (Item #553-B). I cut out parts from two filigree pieces and using E6000 to apply them to the MB#-002 Oval Hatpin-Bronze. Then I used Patina Rub-N-Buff on the outside of the bezel and the wings. 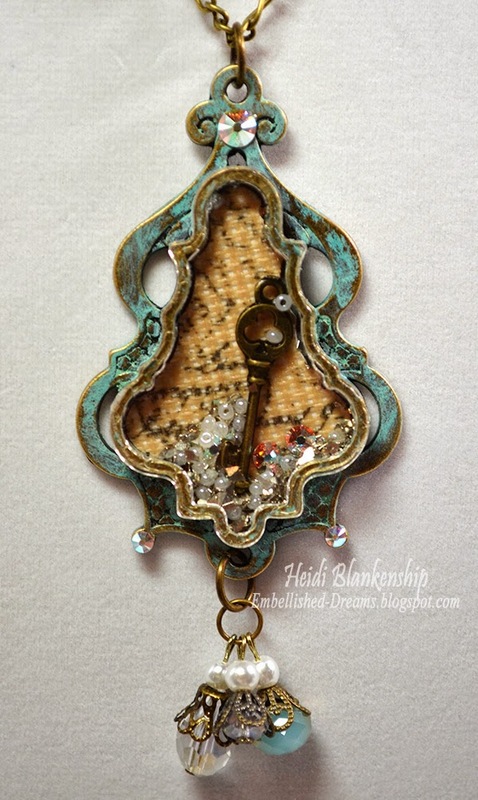 Love, love, love how the Patina looks on the bronze filigree pieces! Next I added some SS12 Aquamarine Flat Back Glass Rhinestones, and SS20 Aquamarine Flat Back Glass Rhinestones to the wings. Then I added some beads, Clear Rhinestone Rondelle Spacer Beads - 6mm (Item #BD006-P/CL), and Bronze Filigree Bead Caps (Item #CAP052-B) to the bottom of the MB#-002 Oval Hatpin-Bronze. Same as the first one I used a round nose pliers to create a loop and curve the hatpin. So thrilled with how this one turned out! 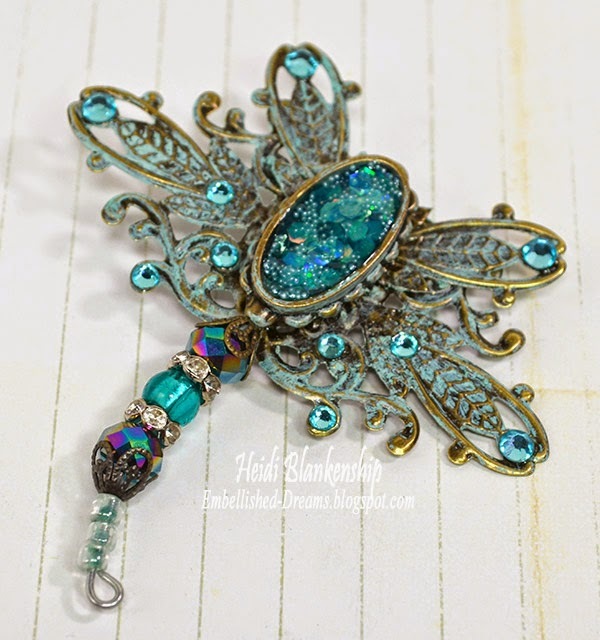 I hope these dragonfly beauties will inspire you to think outside the box and use filigree pieces and hatpins in different ways and have fun creating! Hello and Happy Monday! 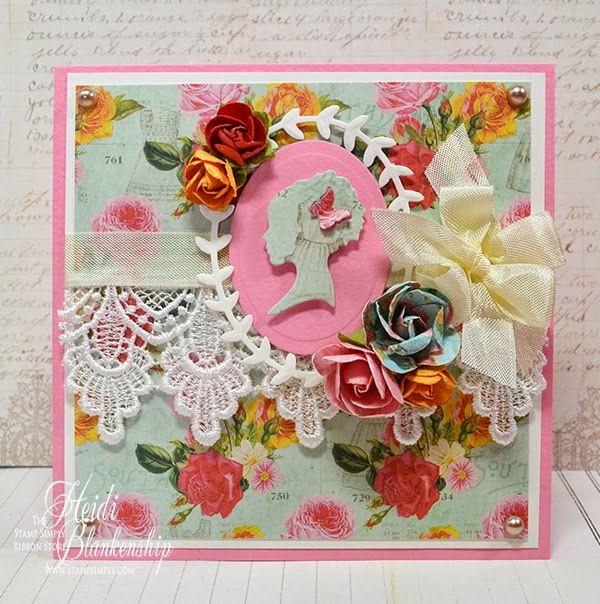 Today, is my day to post for The Stamp Simply Ribbon Store and I have a floral card to share with you using some of the beautiful Prima Anna Marie papers and Prima Anna Marie Flowers. 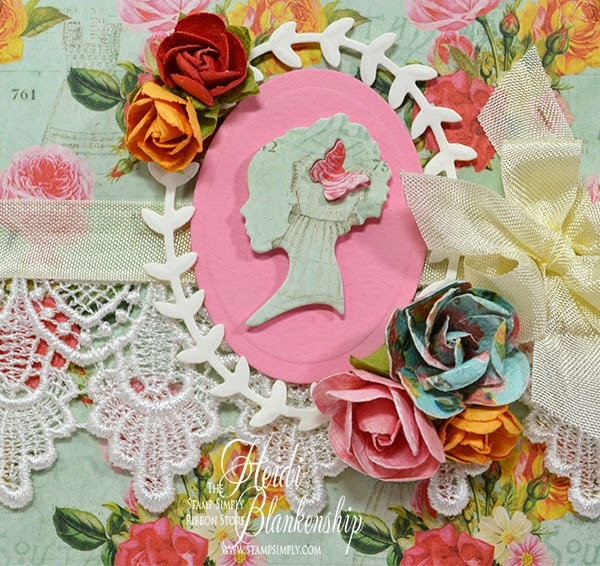 Check out this gorgeous Prima Anna Marie paper! I just love the beautiful roses and the colors are so pretty. The base of the card is pink cardstock with a layer of ivory and then the pattern paper for the card front. Then I added some Venise Lace 1.75" - Gabriella Ivory and Cream Seam Binding. Next I used the S4-110 Classic Ovals Lg and IN-010 Silhouette die templates to cut/emboss the die cut shapes. 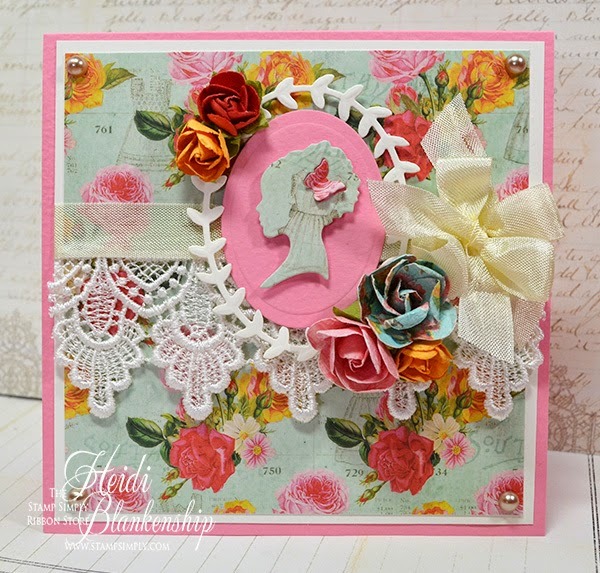 I added some 3D Foam Squares to the die cuts to add a little dimension and then I some Prima Anna Marie Flowers. To finish off the card I added some Melissa Frances Tan/Brown Pearls. Here is a close up. Love the beautiful lace! Hello everyone! Today, I have a beautiful bracelet to share with you using the Jewel Loom™ by Julianna C Hudgins from Beadalon® and gorgeous crystals and beads from Connie Crystal™. To create the bracelet, I use 4 strands of Artistic Wire® 22 Ga Non Tarnish Silver for the warp threads on the Jewel Loom™. I used Light Blue Frosted Round Beads and Sapphire Round Crystals to weaved 37 rows using the WildFire ™ Frost Weaving Thread. Next I added the Suncatcher Mixed Media Blue Theme crystals and beads to the center and wire wrapped to attach them to the bracelet and hold in place. Then I removed the bracelet band from the loom and made loops on the end of each wire. I connected the wires with jump rings and added a clasp. I also added some SS16 Clear Flat Back Crystals from ButterBeeScraps. For tools I used the Jewel Loom™ by Julianna C Hudgins, Flush Cutter and a Round Nose Pliers from Beadalon®. Love all of the sparkle from these gorgeous crystals! Jewel Loom™ by Julianna C Hudgins! I hope you have a wonderful weekend and a Blessed Easter. 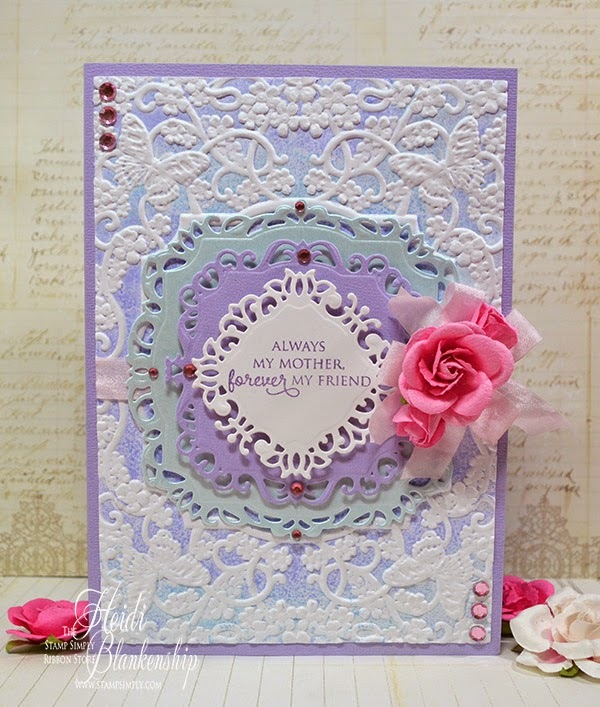 It’s that time again, for the Spellbinders® Blog Team to do the Design-abilites Blog Hop. We want to share some fun, and creative projects with you. Our blog hop is every other month on the 16th and we will provide a link list to each of the Blog Team Design Members. 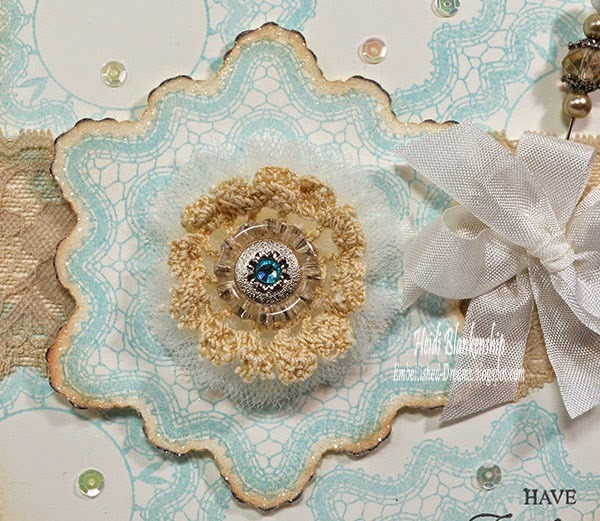 Before we get started, we want to let you know this blog hop is just for creative inspiration; we are not sponsored by Spellbinders Paper Arts®. Sometimes we might not all be able to participate, but we would still encourage you to visit all of the Blog Team Design Members and check out their blogs. 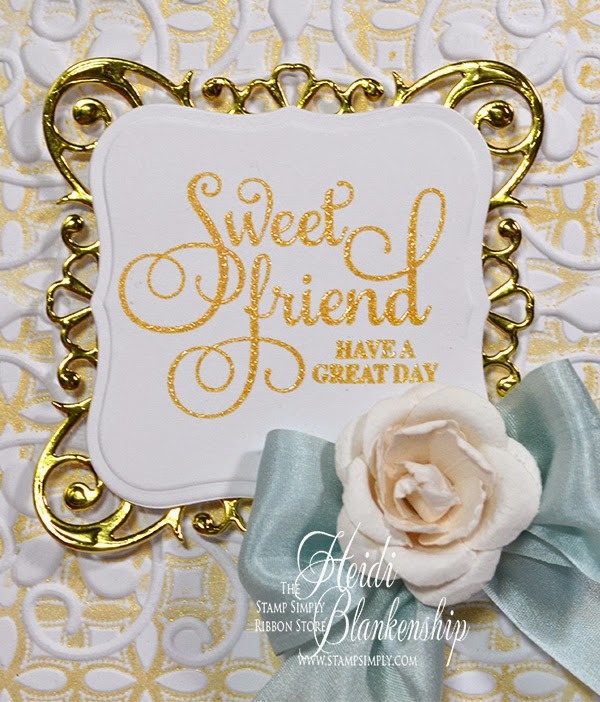 I have to tell you I am loving the New A Gilded Life Collections from Spellbinders Paper Arts®! I love to make jewelry and chunky charms and the bezels from this collections are so beautiful. If you don't make jewelry these bezels would still be great embellishments on your cards, scrapbook layouts or to add on to your DIY home decor projects--so many possibilities! 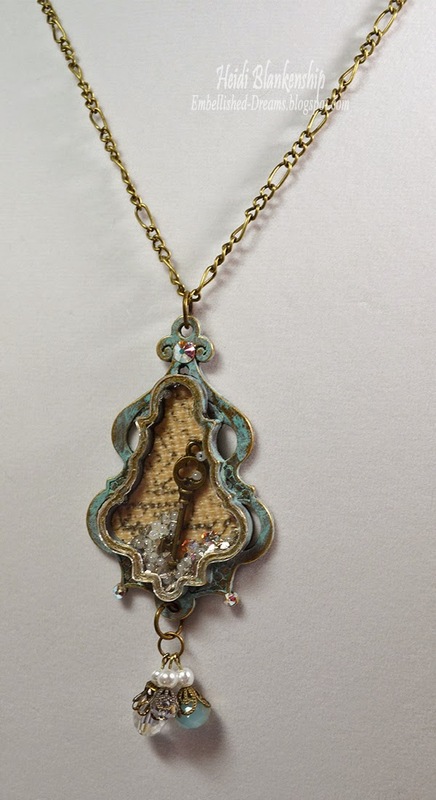 Here is a necklace that I designed using the GLLB-004G Large Chandelier Bezel - Bronze by: A Gilded Life. One of the things I love about these bezels is that they come with a clear plexiglass cover so you can fill the bezels with beads, glitter, charms, found objects, ephemera paper, bling and fabrics just to name a few. This allows you to create your very own unique and personalized bezel. On the outside of the bezel I applied some Patina Rub-N-Buff to give it more of a vintage look. For the inside of the bezel I die cut a piece of printed burlap using GLD-004 Chandelier Die. Then I used some liquid adhesive to adhere the burlap inside the bezel. Next I added some Silver German Glass Glitter, Swarovski AB Flat Back Crystals, Pearls and a Key to the inside of the bezel. I used more liquid adhesive to add the clear plexiglass cover and then set it aside to dry. Here is a close up of all the little goodies inside the bezel. I also added a few more of the Swarovski AB Flat Back Crystals to the outside of the bezel. I created some bead dangles to hang from the bottom of the bezel. I used Bead Cap CAP114-B, Bead Cap CAP052-B, Bronze Jump Rings from ButterBeeScraps and for the beads I used Pearls, Crystal Teardrop Bead, Round Crystal Bead, Aqua/Brown AB Round Bead. Once the bezel was done then I added it to Bronze Chain CH206-B from ButterBeeScraps. 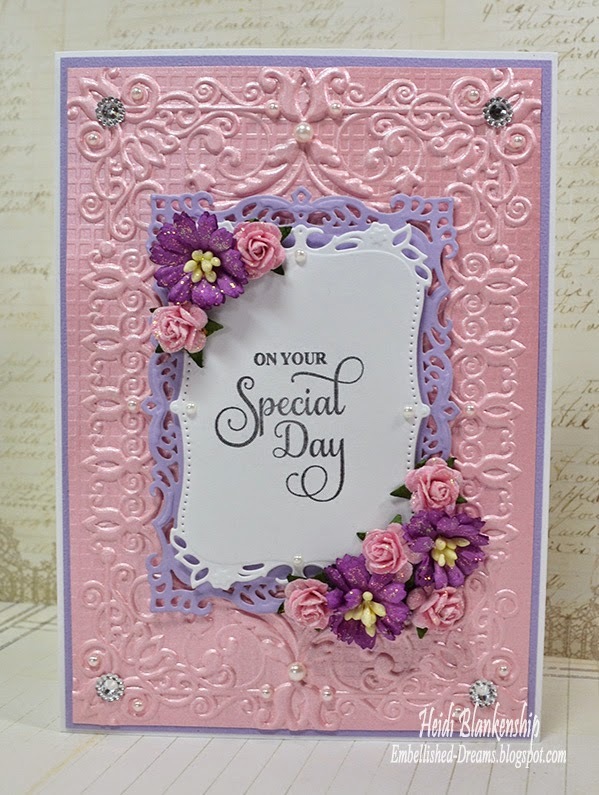 Please be sure to visit all of the Spellbinders Blog Team Design Members in the link list below to see what they have created to share with you. Just as a reminder not all of the designers are able to participate in the Blog Hop but I would still encourage you to check out their blogs--they are filled with creative inspiration! Hello blogging friends! It's time for another Tutorial Tuesday with JustRite Papercraft. For this Tutorial Tuesday I will be showing you how to use different colors of Distress Inks to ink the edges of die cuts and your cards to totally change to the look. Here is a look at the four cards I designed for the tutorial. The first card is just basic stamping and doesn't have any distressing. For the second card one ink is applied and it is very lightly distressed giving the card a shabby chic look. Two colors of ink were used on the third card to give it a vintage look. Last but not least on the forth card three colors of ink were used to give it a vintage burnt edge look. You can see the video tutorial and more photos with all of the details over on the JustRite Inspiration Blog. Simply leave us a comment on the JustRite Inspiration Blog--click HERE or on Heidi's Video telling us if you currently use ink to distress your projects and what you use to apply ink to your projects with. Hello and Happy Monday! Today, is my day to post for The Stamp Simply Ribbon Store and I have a beautiful white and gold card to share with you using the letterpress technique. Here is the card that I designed. It came together pretty quick and easy and the gold gives it a touch of elegance. The card base is white and then I layered it with a piece of Bazzill Mirror Cardstock Gold. Next I cut a white mat for the card front and lightly misted it with water on the front and back. Then I used a Brayer and Delicata Golden Glitz Pigment Ink and applied ink to the E3DS-004 Ornate Labels One M-bossabilities Folder. Next I placed the white cardstock mat inside the folder and embossed it. Doing this creates a beautiful letterpress on the paper. Next I used S4-426 Luscious Labels One and another piece of Bazzill Mirror Cardstock Gold to cut/emboss a beautiful label die cut. 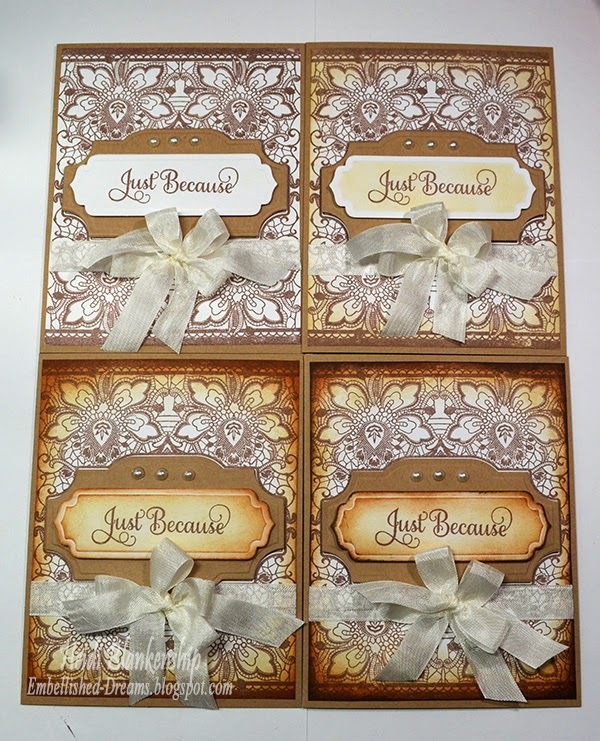 Then I stamped a sentiment from JustRite® Papercraft-CR-03885 Grand Sentiments Clear Stamps using Delicata Golden Glitz Pigment Ink and heat embossed it using a heat tool and Ranger Super Fine Clear Embossing Powder. I used S4-161 Labels One to cut/emboss the sentiment. I used EZ Runner® Permanent Strips-Refillable Dispenser 49' to adhere the layers and 3D Foam Squares to pop up the die cuts. To finish off the card I made a bow using Light Blue Silk ribbon and added a Prima LeMia Flowers Brown Cream to the center. I also added a few Melissa Frances Pearls Tan/Brown to the corners.